Cocoa application for solving binomials. Is there a better alternative to Parabinomial Theorem? Is Parabinomial Theorem really the best app in Science category? 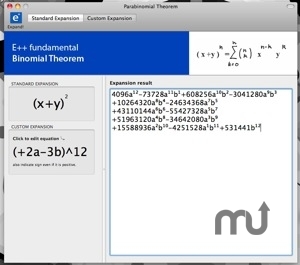 Will Parabinomial Theorem work good on macOS 10.13.4? Parabinomial Theorem... Solving complicated binomials can never be easier. This mac-friendly Cocoa application will help you do it in just a single click for no cost. It is also opensource: written in Objective-C. Useful for developers new to Mac OS X development. Parabinomial Theorem needs a review. Be the first to review this app and get the discussion started! Parabinomial Theorem needs a rating. Be the first to rate this app and get the discussion started!